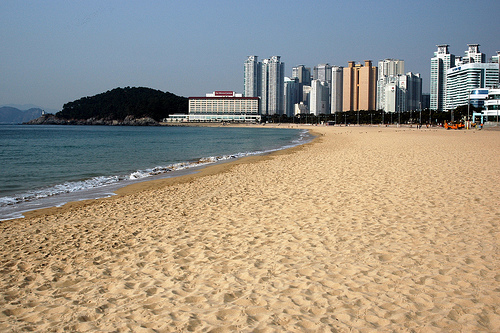 On June the weekend of June 22-23, I took my first trip to Busan, which is on the southern tip of Korea. 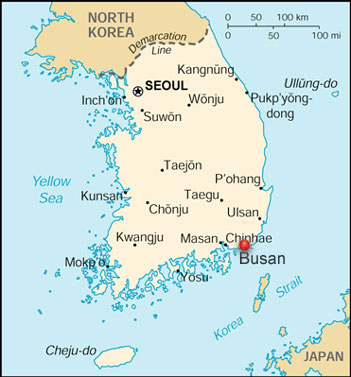 From Seoul to Busan, by bus, it takes about 5 hours. By train, it's about 2hrs 47min. In truth, I went to see my girlfriend, who lives in a city not far from there. 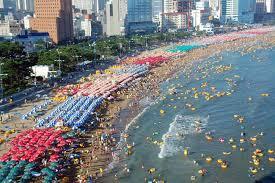 I stayed in the Haeundae Beach area at a hostel. 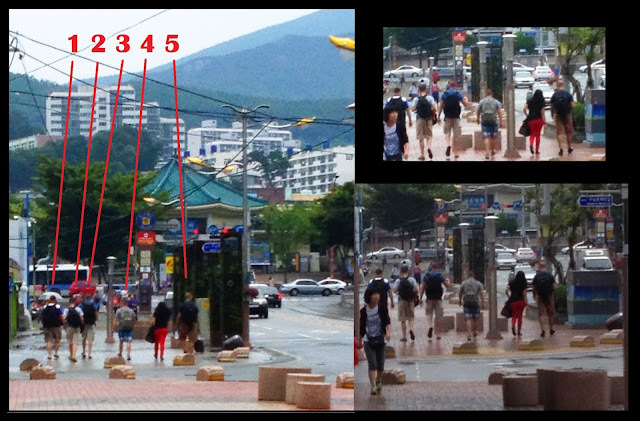 It is a beautiful city, and carries a lot of traits that other coastal cities have - but this blog post isn't a review of Busan (plus I didn't see enough of it to even do a proper review - it being the second largest city in Korea). This night, I did something stupid, which ended up carrying no consequences, but MAN was I boiled over! I had just spent a great day with my girlfriend, she went home, and I was walking back to my accommodations from a nice night-walk on the beach. There's a nice road that follows the beach coast, and there's a main road that runs into it, forming a T-intersection, that I needed to follow to get back to the hostel. As I waited to cross the street, suddenly fireworks started going off all over the intersection in the middle of the road - high and low. They were roman candle fireworks, the kind you can buy from street sellers in Korea, hold in hour hand, and the tube shoots 10 timed fireworks which go about 25 meters and then explode. Cars driving down the road had to slow down to a crawl because of the dangerous situation, and I saw at least one of the fireworks hit the windshield of a car as it was slowly driving, while another one it the door of a parked car along the street. I was pretty shocked. 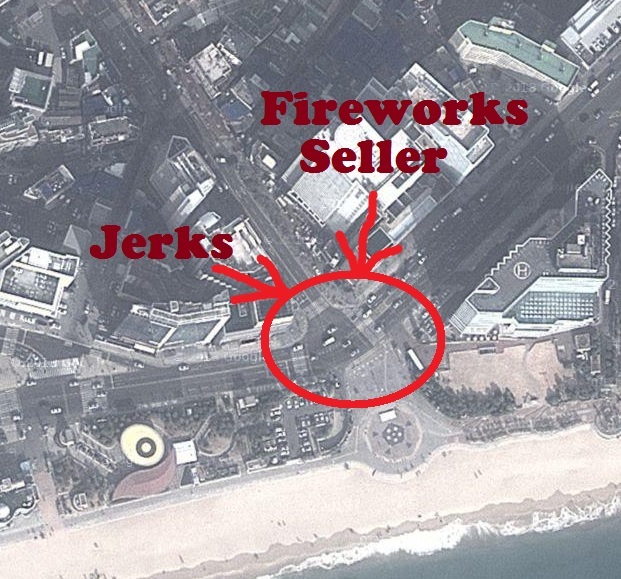 The light turned green, so I crossed the street to one side of the T-intersection and passed the cart of the woman who was selling the fireworks. She wasn't there, though. She was across the street, angry and yelling, where I saw a group of foreign guys. They were white, well built, and had short buzz cuts which are typical of the American military. Naturally - I suspect they were off-duty soldiers... BUT I have no way of knowing that for sure. 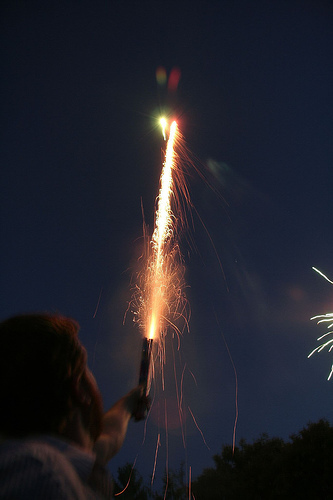 There were 5 or more of them - and each of them had bought a few roman candles and were launching them into the street at cars and into the air, high and low and everywhere. They were whooping and hollering, as everyone stood there staring at them. Some people were astonished. Some people were a bit afraid and stayed inside buildings. Others, like the seller - like myself - were just angry! I just stood across the street from them, extremely angry, staring at them. Most of them ran out of fireworks and wanted to move on. The crosswalk turned green, so they started walking towards my side of the street. Two of them hadn't finished their fireworks but didn't want to be left behind, so they quickly lit the roman candles and threw them into a nearby bush! The fireworks shot out from the green bushes at random angles. All the people stayed away and just watched in astonishment. They shot towards the street, ricocheted off the buildings and bounced on the ground. Then the stragglers jogged across to catch up with the rest. They looked back at me. So I said, "you make ALL of us look bad!!!" They kept walking away but began calling out curses at me. So I shouted, "GO BACK WHERE YOU CAME FROM!" And that's pretty much were it ended. I was too angry to consider the fact that there were 5 of them and that they were all bigger than me. I wanted to say more, but left it at that. The next day, as I was searching for a place to have lunch, I saw them again. They didn't see me (or didn't recognize me), for which I was glad, but I am embarrassed that I didn't snap pictures of their faces for my blog. I would LOVE to expose these guys. I only got pictures of them from down the road as they walked towards the subway station. These are the guys. The girl with the red pants is with them, but she wasn't with them the night I saw them. Korea isn't the most foreigner friendly nation. Not by a long shot. Korea has a history of wanting to be left alone, and closing itself off from outsiders. Older Korean people are weary of outsiders, and believe we bring crime and drugs to the nation. As a foreigner who lives in Itaewon: While I don't believe we foreigners do more harm than good... I am extremely disappointed when I see people giving substance to such base stereotypes. Guys like these are a huge part of the problem, and when I see stuff like this, it makes me especially angry.